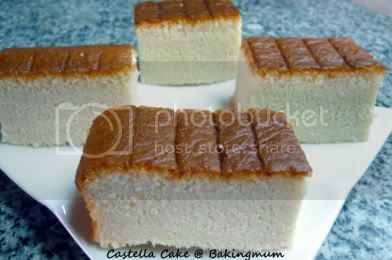 I saw this Castella Cake (Japanese Honey Spongecake) in Ching's blog and I thought her Castella cake look so nice and tempting. I told myself I want to try out this recipe and here I did. Instead of using all purpose flour (plain flour) I used cake flour and the texture of the cake is very soft. It is spongy and soft but not the chiffon cake type of spongy. I used the wild flower honey I bought from my last trip to Perth and the honey taste is rather strong. I did cut down on the sugar part as I know the honey will make it rather sweet. Thanks Ching for sharing the recipe. 1. Grease the square pan with baking spray. Cut out a parchment paper the size of the pan for the bottom of the pan and place it on the pan, spray it with baking spray too. Preheat oven to 350 degree F and place a rack in the middle of the oven. 2. Mix eggs and sugar with a stand-in mixer for about 5 minutes or until batter forms a ribbon when the wire whip is lifted, the color should be light yellow. 3. Add the flour and vanilla extract. Next add the milk, beat it well. Then add the honey and mix it again well. Last, add the oil and make sure it is incorporated into the batter thoroughly. 4. Pour the batter into the prepared pan. Place it in the oven and bake for 10 minutes in 350 degree F (190C). After that, lower the temperature to 325 degree F (170C) and bake for 35 minutes or until a cake tester comes out clean. 5. Remove from the pan as soon as it is done. Place it on the cooling rack and let it cool completely. Wrap with plastic wrap overnight before cutting. how did it taste like? wow.. this is nicely baked! I still have no guts to do it after the first failure. Really admire your baking! Tracie, it taste like normal spongecake except that the honey taste is rather strong. KitchenCorner, you can try this recipe, it is very easy to follow. Just make sure the egg and sugar part is well beaten. Ching, I didn't know about not using cake flour part. Anyway, the cake is really very very soft and fine especially after your have refrigerated it. Yes you can replace it with melted butter. However, cake that has butter in it and left in fridge will harden up whereas cake using oil will not. I love how your cake top brown so nicely and uniformly. what oven are u using ? hi baking mom, wat u mean by the egg and sguar mix till like ribon stage? HI Baking Mum, who do you mean by whole milk? Whole milk is full cream milk but you can just HL milk or skimmed milk if you prefer. At step 3 of method, do you add all the flour at one time? Do you have to fold in gently or do you beat or mix it with the electric mixer? Same for milk, honey and oil, do you mix using mixer after each addition? When you say "beat it well" and "mix it well", how can I tell whether is it well enough, do I have to worry about deflating the batter? Sorry, think that's whole lot of questions. Really love this cake and hope I know how to bake it. Must store overnite then can cut the cake? Is there min hours to store? After storing overnite, I remove to cut in slices, do I still need to keep in fridge or can just leave in airtight container? Thanks. Hi Sally, I didn't really store overnight. I only stored for probably a few hours then cut it. After cutting it I kept it in airtight container and left it back in the fridge. Hi Anonymous, yes I added all the flour at once and use the mixer to mix at low speed except when adding oil, I use spatula to mix in well. To me mix well mean I fold in the ingredients and make sure all the flour are incorporated well into the batter. If I don't see any more flour in the batter then I will stop. But I also try not to overmix it. Hi Hugbear, I have just tried to bake this cake following your method to use cake flour. However, the cake turned out to be quite dense. May I know what went wrong? hi there, I tried this cake yesterday, it turn out dense as well, not soft althought the taste is good. Please advise what's wrong. KS, you can try with bread flour or plain flour as suggested by my fellow blogger friend. v interested to bake this but would like to ask, what is the size of the eggs ie in terms of grams? also, is there an eggy taste since the no of eggs used is quite a lot. Octopusmum, the eggs should be at least 70g each. No eggy taste but the honey smell and taste is quite strong. thks for the explanation! will try this soon. going to bake this tonight, finally:) would like to ask, do i need to sift the flour? Octopusmum, yes I sifted the flour. thks for the reply. can't wait to try it out tonight, wish me luck! Octopusmum, sounds like you overmixed the batter. I tried baking once...but the center caved in, but the taste was very good. can use other kind of oil? e.g. bran oil instead? Yes Yono, you can use bran oil or corn oil or sunflower oil, etc.